Gibson does a terrific job directing...His vision is clear....including moments through Jesus’ eyes that are haunting. Generally, movies with a religious undertone tend to be controversial and when Jesus is the main character, that controversy tends to be doubled. Such is the case with Mel Gibson's (Braveheart) 2004 film The Passion of The Christ. While it opened to modest acclaim and solid box office numbers, it definitely had its detractors. While the DVD first hit the market over 10 years ago and the Blu-ray definitive edition came out five years later, Icon Productions has now released another version including Digital download. We all know the Bible stories about Jesus of Nazareth (Jim Caviezel; Person of Interest) and how he was persecuted and killed by the Romans. There have been numerous films depicting his life, death and resurrection. Gibson's version documents the last 12 hours of his life and the torture he endured. The film begins with Jesus praying in Gethsemane as we see Judas (Luca Lionello; Cover Boy…Last Revolution) betraying him and receiving his reward. Jesus is then taken to Sanhedrin to face the Priests and the accusations against him. He does not deny he is the son of God and is sentenced to death for Blasphemy. Jesus is then sent to Pontius Pilate (Hristo Naumov Shopov; Undisputed 3: Redemption) who, while seeing no reason to condemn him to death, eventually bends to the will of the people and orders Jesus's crucifixion. We then see his torture and death. This telling of the classic religious story is slightly different than most. While there are a few details that stray from the Bible story, such as Jesus killing a serpent while he is praying in Garden of Gethsemane, the majority of it is what we have come to expect. However, this version is also extremely violent and bloody, garnering a hard "R" rating when it first came out and turning off some viewers; hence, much of the controversy. The torture scene is difficult to watch and the moments when they nail his hands to the cross rival many of the best slasher films for blood and gore. The cast stands out as one of the best things about the film. Shopov and Lionello are very good and Maia Morgenstern (Ulysses' Gaze) as Jesus' Mother, Mary, is excellent. Of course, Caviezel has a career defining performance as Jesus, elevating the movie from a decent film to great one. His ability to portray emotion with nothing more than a look transcends the story and makes the audience feel his eyes as if they were burning a hole directly through us. Gibson does a terrific job directing, for the most part. His vision is clear as we see various vantage points throughout the film, including moments through Jesus' eyes that are haunting. Unfortunately, the effects are cheesy, especially when the temple breaks apart. I felt like I was on that old Disaster! ride at Universal Studios Orlando. Also, the androgynous, albino Satan was weird and distracting. The Blu-ray is presented in 1080p high definition video, which helps give the realistic feel. Watching Jesus' flesh being torn from his body is chilling and the blood dripping from him is gruesome. The DTS-HD master 5.1 audio is crisp and clear and the dialogue doesn't get lost. The combo pack doesn't offer any new extras, other than Spanish subtitles, to go along with the already present English ones. Otherwise, the minimal extras include an insightful audio commentary, a re-cut version of the film and Biblical footnotes that are even more distracting than the subtitles and music commentary. The Digital download is a nice added feature as well. If you are a Christian, you will mostly like enjoy this telling. As a Jew, the anti-Semitic undertones made me uncomfortable and annoyed. Most other religious groups may find the telling interesting if not bloody. 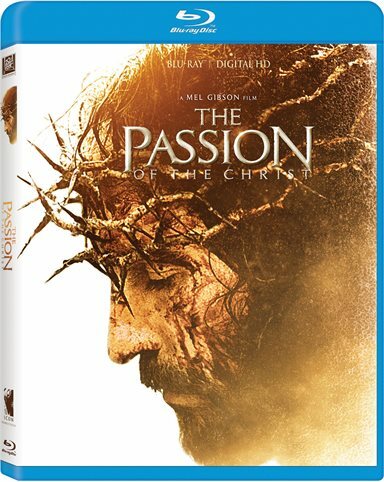 Download The Passion of the Christ from the iTunes Store in Digial HD. For more information about The Passion of the Christ visit the FlickDirect Movie Database.